Hoping to train team members to be better communication partners for their AAC students/clients but overwhelmed by the thought of all the preparation? Relatively new to AAC and not sure what content to share in your training? Looking for additional resources to utilize in your existing training sessions? 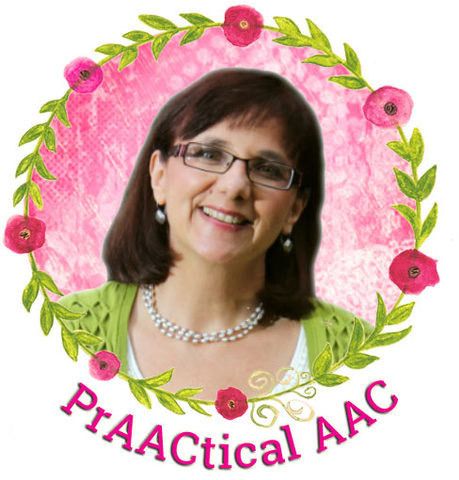 Good news, AAC friends! This post is for you. We’re so happy to have SLP Tabi Jones-Wohleber returning to the blog to share more of her wonderful AAC resources. Tabi works with young children at the West Virginia Birth to Three program and serves on the AT Team for Frederick County Public Schools in Maryland. Today, she launches a new series on partner training that focuses on the use of aided language input and other facilitative strategies. There are 11 modules in all (1 overview for administrative discussions and 10 for communication partners) and each one includes slides, handouts, discussion prompts, links to videos, and activity suggestions. Fasten your seatbelts – there’s a lot to cover. Despite tons of support on core vocabulary, which everyone “gets” on some level, there is a real need for ongoing support of communication partners to look at the actual nature of the interactions (which tend to look more like compliance than communication). This is the first of 11 posts sharing resources for ‘Model as a MASTER PAL’ partner training. Congratulations on Presenting Model as a MASTER PAL! ‘Model as a MASTER PAL’ was developed to help shape behaviors and belief systems of communication partners supporting individuals who use AAC. It was developed from the premise that 1) AAC implementation is not intuitive, and 2) communication is not compliance. This training series assumes topics related to core vocabulary instruction and explicit creation of communication opportunities have already been covered, and communication partners require additional information to improve the effectiveness of implementation. The structure of this training series lends itself to delivery over time for ongoing discussion and support related to AAC implementation. It emphasizes that modeling language with AAC is the communication partners responsibility (full stop)! 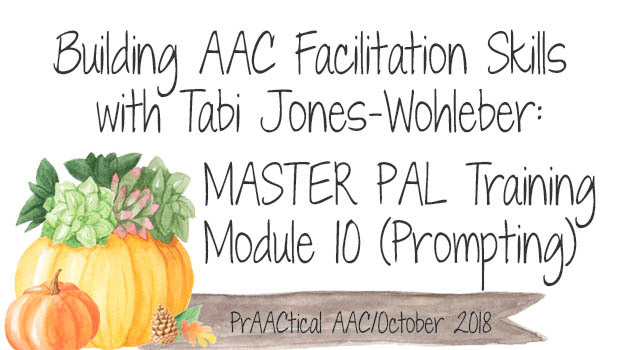 Begin with a definition of the ‘Model as a MASTER PAL’ acronym and an overview of AAC as participants may fluctuate from session to session and this helps to ensure that everyone is on the same page. The Warm Up Discussion follows. Slide fonts are green and italicized to cue you to engage participants. As you go through the body of the presentation, the Talking Points for a slide or group of slides is outlined in your Facilitator Guidelines. This gives you an understanding of the thought behind the slides to help you lead the discussion. A Re-cap reviews the key-points/takeaways and provides a consistent finishing point. Each module ends with a time for Comments and Questions. To modify or edit Google Slide(s), copy/paste the entire Google Slide and create a new document in your Google Drive. You can download a document with these Trainer Guidelines here. Ready to get started? Here’s what you’ll need. We’re just getting warmed up! Come back next week for the second module in this series. So excited to see this! I just heard your Talking With Tech podcast and thought it was great. Thank you for sharing so much of your work! I’m so glad you enjoyed it, and am happy to share. We are a hard-working field…no need to reinvent the wheel!!! Love this idea! Exactly what my school district needs. To piggy back on core vocabulary….has anyone tried to identify core vocabulary throughout a school or home? For instance, at the water fountain, core words would include: more, stop, drink, want, I, like, etc. Didn’t know if there were any resources out there that people were using! I would love to see examples of core vocabulary by context! I bet lots of us do this in informally and in-the-moment. I don’t know of anything systematic, but I like the idea!! Love this! I will be training my staff with this throughout the year! Thank you for taking the time to put this all together and share it! What a great resource! Can’t wait to see it all! Hope you enjoy it, Judy. Tabi certainly did an amazing job in developing these resources, didn’t she?! The last module in this 11-part training series will be published later this week. Stay tuned! My AT Team had a goal of putting together a para-educator training program just like this and you have done it for us! This is an amazing and beautiful resource! Thank you so much! I will be singing your praises at each meeting!! Fantastic. So glad these tools will help you pursue that goal. Training para-educators is important work. 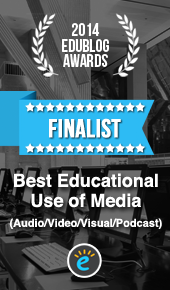 Our kiddos need them to have access to this information and the opportunity for discussion on these topics. Kudos! I love these trainings, and I have 2 hours during my school’s in-service next week to do some AAC training. Is there anywhere that gives an idea about how long each module/section would take to present? Yes! In the master folder there is a sub-folder titled “Start Here”. In it there is a document called “Planning for Model as a MASTER PAL.” It gives an estimated time if all slides and activities are used as well as links to all documents. This can help you edit as needed for the time you have.